Heritage poultry breeder Frank Reese has been hatching a plan to build the Good Shepherd Institute for over two decades. Now, with help from MASS Design Group, his plan has moved one big step closer to reality. Frank Reese started strategizing about ways to train his successors about 25 years ago. The fourth-generation Kansas poultry farmer had seen the industry begin to consolidate and he worried about keeping the kind of work he did—and the heritage turkeys, chickens, and ducks he raised—alive. These are the poultry breeds most Americans raised, ate, and prized for generations. And while they resemble the birds you may find in today’s livestock operations, they’re very different animals. With names like Standard Bronze, White Holland, and Silver laced Wyandotte, they grow slower and live much longer than today’s breeds, mate naturally, and thrive on open pasture. Reese has been raising and mating these birds since he was a child, and he’s proud to own the oldest continuous strains of standard-bred heritage birds in North America. 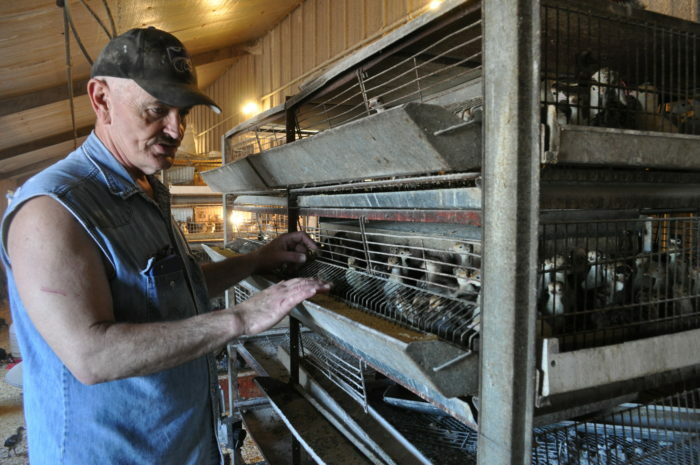 At 70 years old, Reese doesn’t have children to take over his operation, Good Shepherd Poultry Ranch farm, located outside Lindsborg, Kansas. And when he talks about the animals, his voice is tinged with emotion. “These turkeys have been in Kansas for 101 years continuously; they have the right to be here for another 100 years,” he says. For this reason, sharing his knowledge—and communicating the importance of these heritage breeds—has taken on escalating urgency. Reese spent over a decade working with a range of organizations—from animal-rights groups to foodies, speaking at regular gatherings and conferences, and working with Heritage Foods USA to distribute his birds to chefs and high-end retailers around the country. He would give talks about his work, but it soon became clear that truly passing on the depth of knowledge would require something much bigger. Reese envisioned an institute where students focused on agriculture could gather, stay, and absorb some of the knowledge he himself had spent years gathering from his own mentors. Creating an institute would cost money and require the kind of time and attention that full-time farmers don’t generally have to spare. “I had a lot of people who were interested, but I really couldn’t put the piece together,” he says. Then, last fall, that all changed when the film “Eating Animals” debuted at screenings and film festivals across the country. 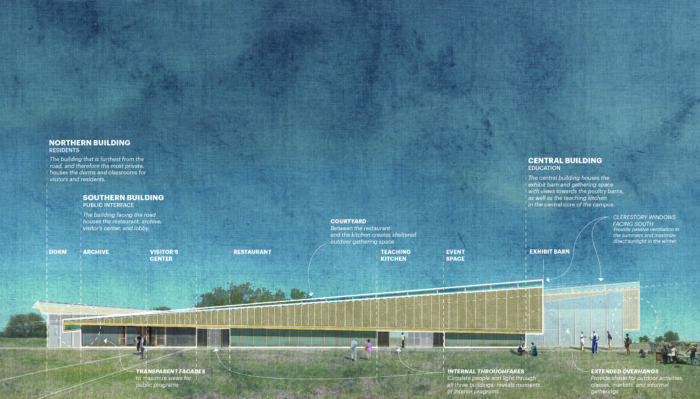 A rendering of the Good Shepherd Institute by MASS Design Group. Reese is featured prominently in Jonathan Safran Foer’s 2009 book of the same name (as well as several other prominent books, including last year’s Big Chicken) The documentary—directed by Christopher Quinn and produced by actress Natalie Portman and Twitter founders Evan Williams and Biz Stone—is full of heart-wrenching, illuminating, and visually arresting footage of Reese and his animals. And the film has caught the eye of several people set on making the Good Shepherd Institute a reality. First, at the Telluride Film Festival in September 2017, Reese met Emanuel Friedman, an investor with a family foundation called EJF Philanthropies. Then, after the New York screening, Reese heard from Caitlin Taylor, a design director at the non-profit design firm MASS Design Group, known for its socially focused work in the U.S. and Africa, and, most recently, The National Memorial for Peace and Justice or “the Lynching Memorial” in Montgomery, Alabama. 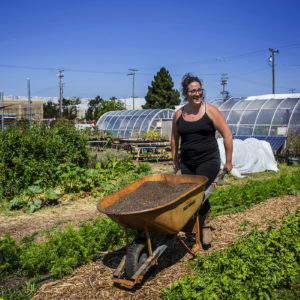 She also co-runs a small-scale Connecticut organic vegetable and flower operation called Four Root Farm and her work at MASS has focused largely on food system reform. Reese did not, in fact, have an architect, and Taylor got to work visiting the farm and drawing up a plan with a small grant from EJF Philanthropies. The idea was to develop the concept and have a visual rendering of the institute in place before the film made its public debut in June. Since then, Reese and Caitlin have been attending “Eating Animals” screenings and events across the country in an effort to engage stakeholders and funders in the idea of an institute. “Eating Animals” features a number of experts and food producers—from whistleblowers like Craig Watts and Jim Keen, who endure retaliation and alienation within an increasingly Machiavellian industry, to farmers who have stepped out of the business for a range of reasons, to entrepreneurs behind the new generation of alternative proteins, who appear dead-set against any form of animal agriculture. Reese emerges as a kind of hero of the film thanks to his tenacity and commitment to keeping his flocks of chickens and turkeys going against the odds. “At the end of the film, I’m the only one who’s still fighting to find an alternative to industrial farming,” he says. Indeed, there’s a beauty and a starkness to the footage of Reese’s farm—and an abiding sense that he’s the last of his kind. Simone Friedman, head of philanthropy and impact investment for EJF Philanthropies. For that reason, she added, “we’re very interested in helping get his Institute going and really supporting his legacy.” Friedman is also hoping to bring other funders onboard, and she hopes to help build a larger constellation of new infrastructure to support the introduction of heritage-breed animals to more consumer markets. The grantmakers have also funded a major audience engagement effort related to “Eating Animals” and has spent the last several years working to introduce heritage poultry to the Kosher market. 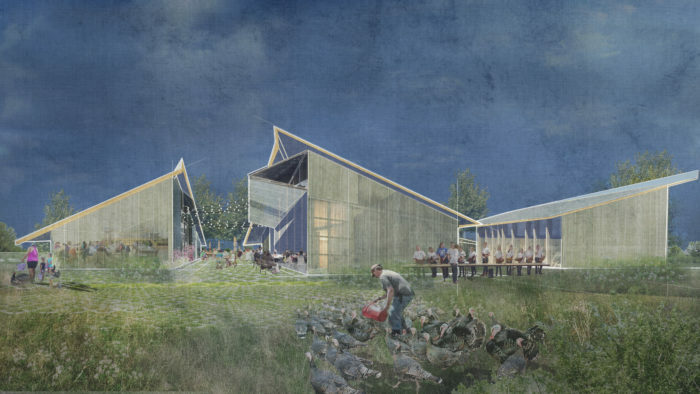 The goal of the Good Shepherd Institute is to “preserve essential biodiversity, and provide a unique model of agricultural education, ecological resilience, and food system innovation.” Image courtesy of MASS Design Group. For some, the film has been a surprising wake-up call about the urgency of preserving small farms and biodiversity in an era of farm consolidation and monoculture. And Taylor and Reese hope that urgency translates to viable support for the Good Shepherd Institute. MASS comes at architecture from a more holistic perspective than most other firms; rather than simply responding to requests for proposals from clients, the planners and architects at MASS prefer to partner with groups that agree to include them in the early-stage decisions and strategizing that allows them to create buildings that solve social and structural problems and allow people to thrive and heal. “We often form relationships with partners who have an incredible project that’s ready to go but it’s having some kind of structural or scale obstacle,” says Taylor. “Frank’s has all the pieces: He has the brilliance, the knowledge, the site, and all of this institutional support and buy-in from people all over the country who want to figure out how to help him make this happen.” MASS has a track record of helping to connect those pieces into an operation and get the project off the ground. For Reese, as for MASS’s other clients, the Institute will be much more than a set of buildings. He hopes to provide a space that allows for cutting-edge independent poultry research as well as ongoing training and education. As he sees it, while there is plenty of research taking place in agriculture programs around the country, the “independent” part of the equation is sorely missing. “All the land grant universities are going to teach students to go to work for the industrial system. If you get a degree in poultry science from the University of Arkansas, you’re going to become a field manager for Tyson. 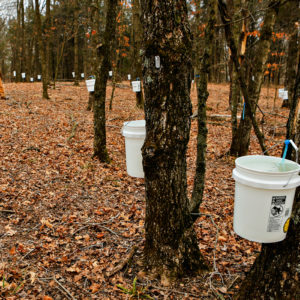 It has nothing to do with actually becoming an independent farmer, in any way,” says Reese. By partnering with a handful of small, existing college programs—and a new program focused on integrated farming that’s taking shape at Bethany College in nearby Lindsborg, Kansas—he hopes students can get to work on providing sound academic research about the value of heritage breeds. The modern poultry industry is highly segmented; the breeding, hatching, and growing out of the birds happens in different locations and is overseen by different people. And over 99 percent of the chickens and turkeys raised for meat in the U.S. have been bred to grow around 5 pounds in five weeks—or much faster than birds like Reese’s grow. For this reason, the industry long relied on antibiotics to “keep the animals alive long enough to get them to market,” he says. And while large poultry companies have moved away from antibiotic strains they deem “medically important,” they still use a class called ionophores. Reese feels that simply switching birds with modern genetics to cage-free and pasture-based practices isn’t much better, because their immune systems are not meant to withstand the conditions outside closed-system barns. In other words, he sees genetics as the key to humane animal farming. Reese’s goal with the Institute is to raise and compare sizable numbers of several different kinds of birds, including the fast-growing Cornish Rock broiler chickens that are raised on large poultry farms, and newly developed, slow-growth Freedom Racers—birds the industry appears to see as a middle ground option—and true heritage breeds like Barred Rocks. “We also want to study the viability of the economics of a market for this type of production,” adds Taylor. Reese’s operation, and a handful of other small-scale pasture-based farms, has been kept afloat by Heritage Foods. Patrick Martins, the company’s founder, also founded Slow Food USA and he has been building a brand, a network, and providing a direct path to over 100 high-end restaurants, for over a decade. But not all farmers have that access. 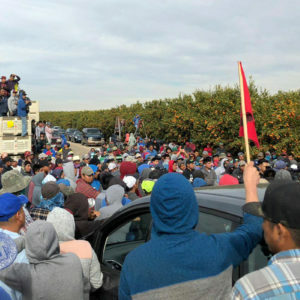 “The regional economic market has to scale in order for other farmers to be able to build viable businesses around this type of production,” says Taylor. “We know the form that type of research that will take, but I think it’s no less important than the husbandry science. The Institute will also include an archive, where all the books, pamphlets, and other materials Reese has collected—and been gifted by poultry researchers and their families—over the years can be preserved and shared. “He has the definitive national history of pre-industrial poultry in his attic,” says Taylor. The Institute’s entrance will also lead visitors directly into a teaching kitchen and dining room—as reaching chefs and eaters is core to the mission of preserving heritage breeds. Reese’s own relative success—or the fact that he has been able to keep his small operation solvent—in recent years, is due almost entirely to the support of chefs around the country, chefs like David Chang, Danny Meyer, Mario Batali, April Bloomfield, and others, who began buying his birds early on and now provide a consistent, reliable market for his meat. Alice Waters of Chez Panisse has also gotten on board. “[Chefs] are the ones who are driving the economy and getting the word out,” says Patrick Martins. “I hope the Institute can be a center for gastronomy, as it’s defined in the Slow Foods world—meaning it includes all the elements that go into understanding the source of the food,” adds Martins. He points to other similar cultural centers such as the University of Gastronomic Sciences in Pollenzo, Italy, as well as Blue Hill at Stone Barns and the Land Institute in Salinas, Kansas. If things go as planned, the Good Shepherd Institute will occupy between 20,000 and 30,000 square feet, and Taylor estimates it will cost between $4 and $5 million to build. Building out the programming and hiring a staff will require a separate budget, but it’s still too early to say how much they’ll need to raise for that piece of the project. It’s a significant investment. But when you consider the larger value, it may be a small price to pay for what it could yield. Across the globe, nearly 100 livestock breeds went extinct between 2000 and 2014 and another 17 percent of all farm animal breeds in the world are at risk of extinction. The United Nations sees livestock biodiversity as a “vital tool against climate change” and included the genetic diversity of both plants and animals in its most recent sustainable development goals. Top photo by Jim Richardson. AS with all articles in Civil Eats, this one was veryt interesting. I do, however, have a few questions. (1) In one of the photographs, chicks are being housed in metal cages? Why are they being contained like this? And for how long? (2) Why is it that so much emphasis and money is being spent on these chickens, turkeys and duck which are being supplied primarily to chefs at high end restaurants, rather than focusing on how to get these birds into the food supply for everyone? (3) What happens to the chickens, ducks and turkeys that are not "up to standard" for the breed? I look forward to your response. Thank you. Willie Nelson may help too..So many youngsters out there..some would love this..just must be committed...THANK YOU for all your life's work...make videos!!! !